It's good to be king, even if you are just a chick. That's what one baby penguin is finding out in Orlando. SeaWorld Orlando welcomed the first chick to hatch at Antarctica: Empire of the Penguin, the all-new attraction featuring a colony of more than 250 penguins from four species – king, Adelie, gentoo and rockhopper. The baby was born Nov. 30. The nearly two-week-old king chick, one of two born in the last two weeks. 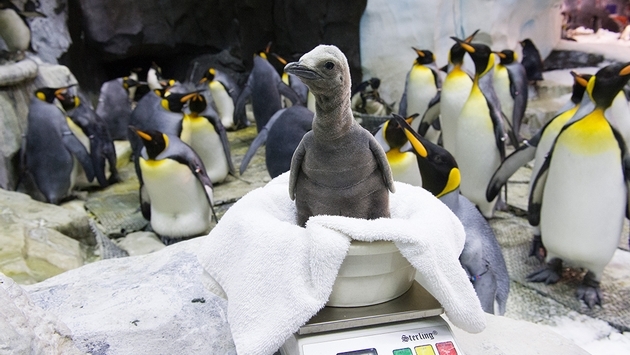 is now weighing in at 30 ounces (882 grams) and currently being raised by its parents with routine check-ups from the SeaWorld Orlando Aviculture Team who monitor the chick’s weight and overall development. The miniscule being will grow to be more than 24 pounds (11 kilograms) and over two and a half feet tall. More chicks are expected in the coming weeks. Caring for the king chick is a full-time job shared by mom and dad, and it starts before the penguin even hatches. Since king penguins don’t build nests, the female lays one egg and both parents share incubation duties by placing the egg on their feet. This is also how they carry the chick once it hatches. Guests may get a rare glimpse of the king chick during feedings at Antarctica: Empire of the Penguin.